Catch Up® has recently been re-assessed for Investors in People and I am really pleased to say that the result was very positive. Well done to everyone involved. We have now received our Investors in People Assessment Report along with the certificate, which has already replaced the previous one on the wall in the Catch Up®office! 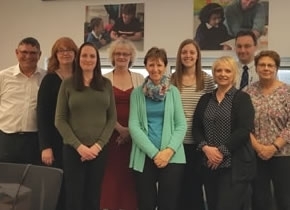 The assessor visited the office, and as well as having face-to-face meetings and checking a whole range of information on paper, he also spoke to some of the Catch Up®team by telephone. The assessment looks at how we work as an organisation and, particularly, at how all the people involved with Catch Up® work together. The assessor looked at our vision and plans for growth, and how our core values are put into practice. Also, at how we involve everyone and the effectiveness of our planning, and how effectively we manage ourselves and each other. The assessment showed that Catch Up® has real strengths, which include learning and development – for everyone – being evaluated as continuously improving and…. Catch Up® met the standard. Why does it matter? Because the better we work together at Catch Up®, the better we are able to work with our schools. And that matters because it is through the schools that we help to make a difference for the children. Investors in People helps us to make even more of a difference. This is a tremendous result and a wonderful indication of the strength of the Catch Up® team.